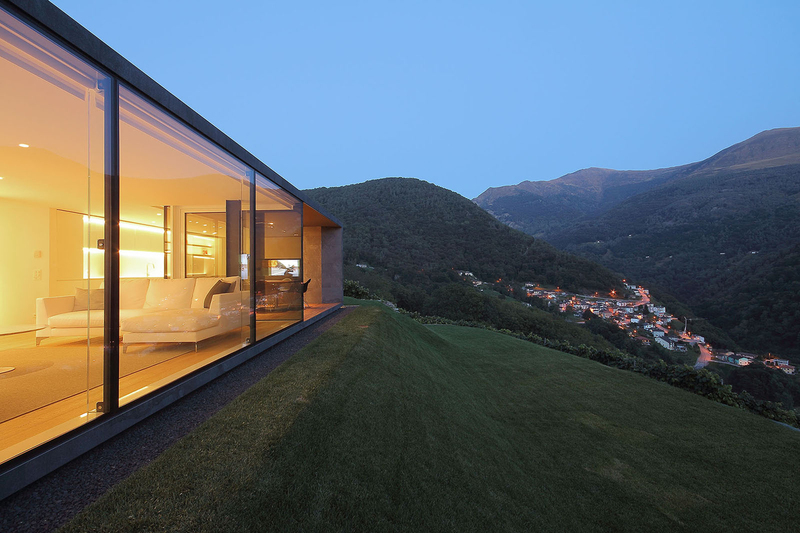 The environmentally friendly features of the Montebar Villa, by JM Architecture, are almost as stunning as the view from its front door. Nestled on a hilltop facing the Swiss Alps, the villa takes advantage of the natural daylight, as well as ventilation from cool air rising up the slopes during summer months. But the quiet beauty of the spot trumps all. The prefabricated wooden home took just a few days to assemble and was designed according to local building codes. The rooftop was required to be dark, ashy gray in color so the home would easily blend in with the nearby peaks and valleys. Appearing to be a natural stone in the surrounding landscape, the only exception is the curtained loggia that folds inward during the winter months. Both rooftop and perimeter walls are constructed with thermally insulated wooden materials, making sure the home meets criteria for high quality energy standards. Insulated selective and low-e glass were used in window installation throughout the home, as well as thermally broken aluminum profile with triple insulated glazing. The flooring is equipped with radiant heating capabilities, which is powered by an electrical pump. Lighting fixtures all feature LED lamps, yet the amount of daylight coming through leaves little need during the bright hours of the day. The south side of the home includes the family living area. Most of the design, including the master bedroom, two bathrooms, kitchen and pantry, technical room, study, and laundry room, are housed in just one floor. The two children’s rooms, however, feature a loft into the vaulted ceiling. There’s no doubt that living in the Montebar Villa captures the essence of tranquility. The prefabricated wooden home took just a few days to assemble and was designed according to local building codes. 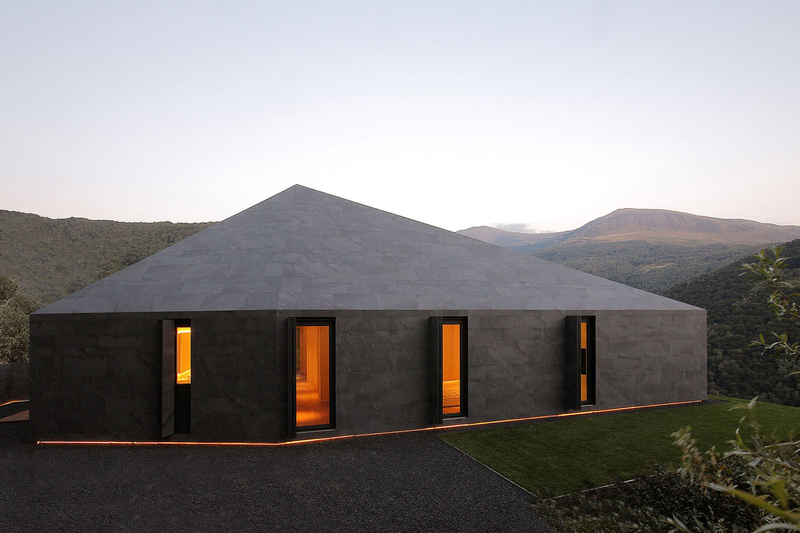 The rooftop was required to be dark, ashy gray in color so the home would easily blend in with the nearby peaks and valleys. Appearing to be a natural stone in the surrounding landscape, the only exception is the curtained loggia that folds inward during the winter months. Both rooftop and perimeter walls are constructed with thermally insulated wooden materials, making sure the home meets criteria for high quality energy standards. Insulated selective and low-e glass were used in window installation throughout the home, as well as thermally broken aluminum profile with triple insulated glazing. The flooring is equipped with radiant heating capabilities, which is powered by an electrical pump. Lighting fixtures all feature LED lamps, yet the amount of daylight coming through leaves little need during the bright hours of the day. The south side of the home includes the family living area. Most of the design, including the master bedroom, two bathrooms, kitchen and pantry, technical room, study, and laundry room, are housed in just one floor. The two children’s rooms, however, feature a loft into the vaulted ceiling. There’s no doubt that living in the Montebar Villa captures the essence of tranquility.